In stock 71 pcs. Also available in our walk-in store. 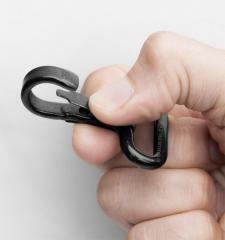 A simple metal spring hook for attaching straps and stuff. A great spare part or component for any DIY projects. 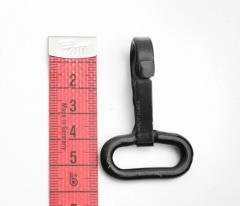 These are Finnish army MILSPEC stuff, these hooks are used on various military straps etc. 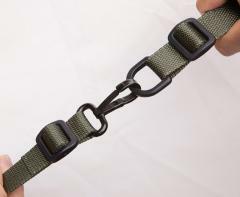 The strap loop 25 mm wide, but can fit wider webbing straps also, they just fold up a bit. 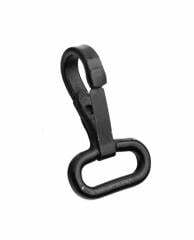 Feels sturdy, works great combined with the "Särmä TST General purpose sling." It can also fit around the PALS natick snap on my canteen cover if I scrunch it together. - simppeli, vahva; kestää taatusti "isältä pojalle"
Ostin aikoinaan 2 kpl rynnäkön kantohihnaan. Molemmat pääsivät vääntymään kantaessa asetta selässä ja näin ollen tippumaan paikalla oleskellessani. En suosittele aseen kantohihnaksi.